Most of us have said “I love this book!” at one point or another. However, what we mean by it may differ a great deal. If you are like me, this statement has little to do with how enjoyable a given read is. Instead, it is literally: what a great object I’m holding! The other day I was in Leiden University Library, my stomping grounds, looking at a ninth-century manuscript containing various school texts. I thumbed through its leaves and saw different individuals writing down different texts. I saw readers mumbling over worn pages, interacting with texts, crossing out lines and writing down notes in the margins. And I saw how even later readers had added their own pages with additions. And that is when I heard myself whisper: “I love this book.” To me, this quirky, millennium-old object, with its dirty and heavily used pages, was simply paradise. 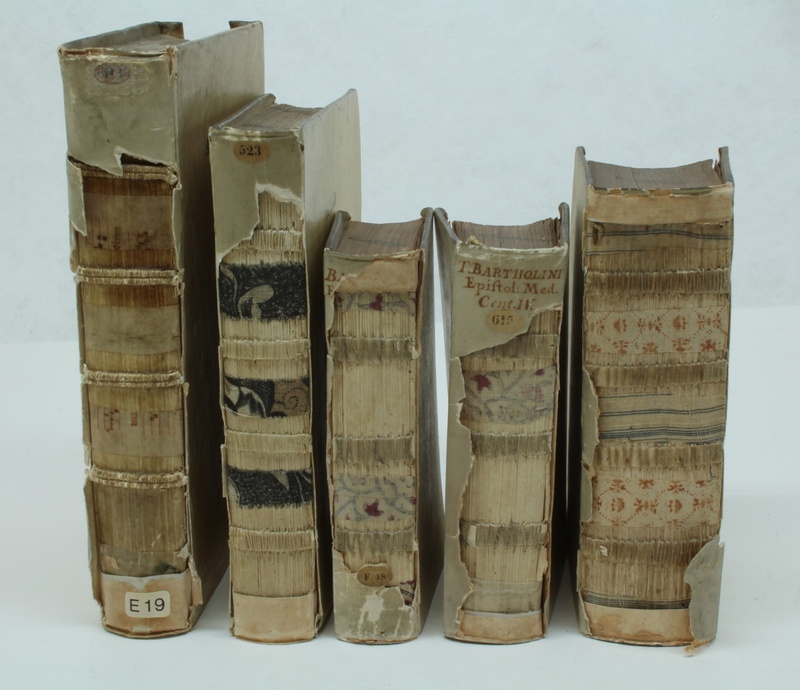 But what makes these worn manuscripts so attractive – and useful – for the historian of the medieval book? Some medieval books look like they were made yesterday. The pristine page still breaths medieval air, as if its maker has just left the room. It’s not difficult to like this type of manuscript: the excitement when you open it is like entering your brand new car for the first time. Or rather, your brand new vintage car, as most medieval manuscripts are pretty worn. These are used books – and they have often been so for five hundred to a thousand years. Importantly, their wear and tear has a story to tell: medieval users were pragmatic and the traces they left behind tell us a lot about how they used a manuscript. For example, a reader may sew a tiny piece of string in the corner of the page (Fig. 1). In fact, this particular manuscript contains many of these make-shift bookmarks, as if the reader was sitting behind the book with needle and thread ready at hand. Bookmarks are great little devices, smart even, as this earlier post shows. Interestingly, they are also quite telling about the popularity of a specific book and in particular which pages were most important – since that is why a reader would like quick access to them. Dirt is another indicator of frequent use and, in a sense, of a book’s popularity. The same manuscript as in Fig. 1 has a lot of dirt build-up in the folds. There are even leaves from trees encountered from time to time (Fig. 2). It is possible that these acted as environmentally-friendly bookmarks, ultimately helping us to gauge a reader’s interest. Wear and tear is another way in which the manuscript shows that it was used a lot – that it had been popular among a group of medieval readers. It is not uncommon to see pronounced discolouration at the lower left corner of the page. The dark patches that can sometimes be observed there result from generations of fingers turning the page. 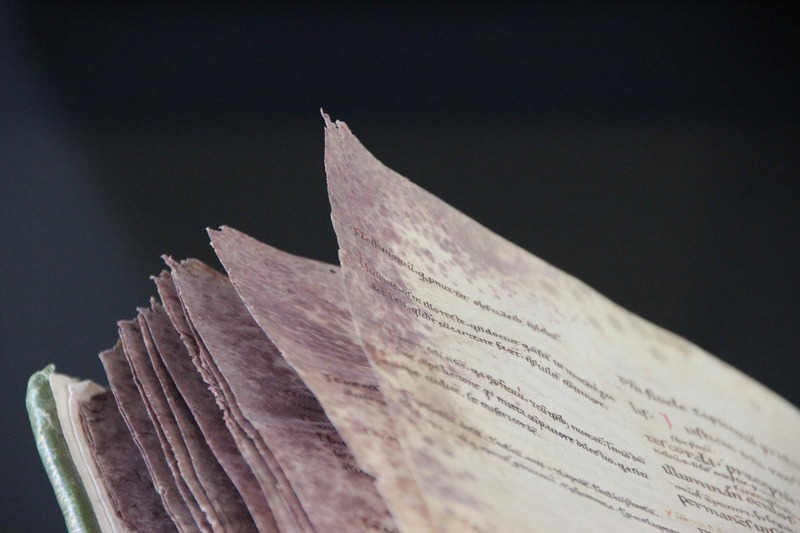 Pages with such dirty lower corners usually also turn quite easily, as if the structure of the parchment is loosened up by the repeated turning of pages. Occasionally one encounters a page like the one seen in Fig. 4, which is dirty all over its surface. One wonders how clean the readers’ hands were – also after consulting such a dirty book. The previous examples have drawn attention to an interesting truism: the more a manuscript was used, the dirtier it became. It appears, interestingly, that medieval readers had a very different attitude towards how one ought to interact with books. 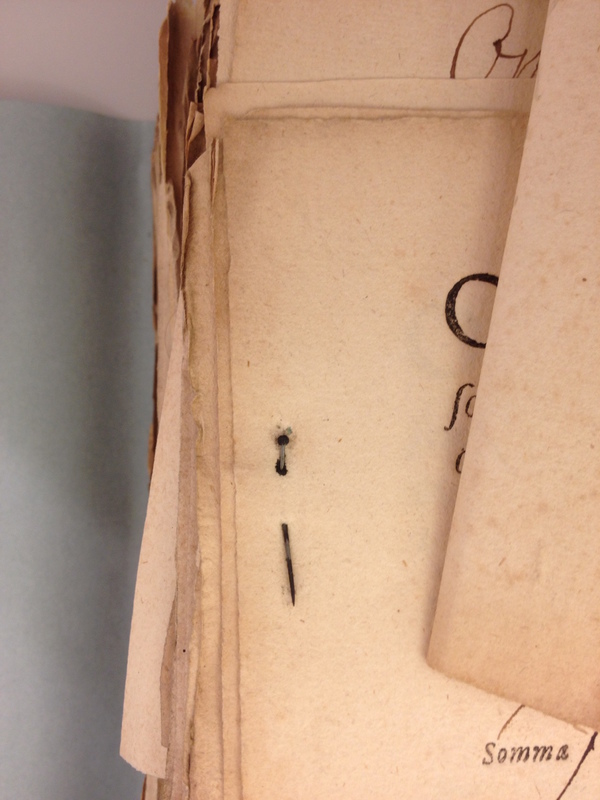 I don’t think many readers today would be willing to stab one of their books and insert a string, as seen in Fig. 1. And who would write his or her name on the page in such joyful, large script as the unknown Peter did in Fig. 4? Judging from the high frequency with which medieval readers jotted down notes in the margins, it becomes clear that books were seen as utilitarian objects, which could be treated in any way the reader saw fit. If the clarity of a text increased from having marginal notes written next to it, then the benefit of having those notes there would override any feelings of hesitation produced by having to write in your book. However, the line between use and abuse is thin. You had to be careful when writing new text in the margins of an existing book, because while the ink was still wet it could easily produce smudges. The reader who annotated the manuscript with Ovid in Fig. 6, wiped out his thought (phrased in Dutch vernacular) by mistake. Peter-Who-Could-Write in Fig. 3 made the same mistake, because his name is also smudged. 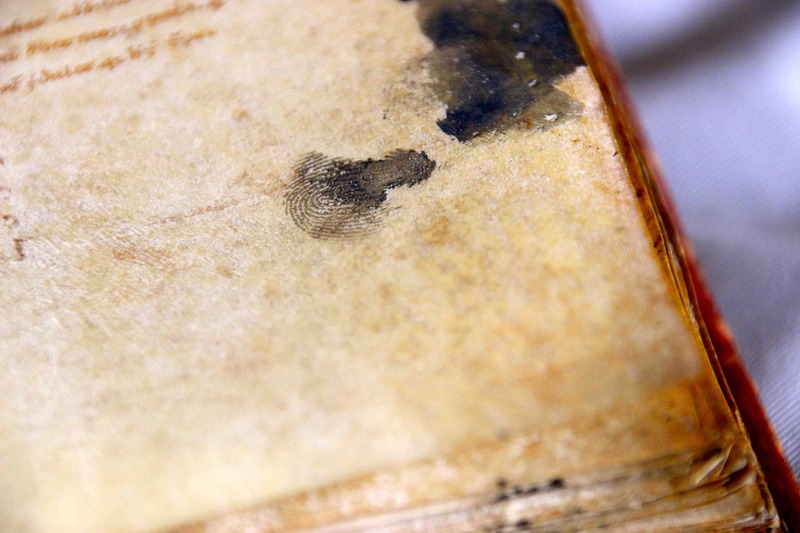 Peter’s finger must have been really dirty, because the parchment surrounding his name shows a lot of inky stains. There are many examples of medieval manuscripts being a victim of their readers’ abuse. Fortunately for us, some abuses provide clues as to how the book was used. A good example of this is the manuscript page seen in Fig. 6, which shows a law manuscript with candle wax dripped all over the text – note the big yellow blob. It is not difficult to see a medieval student at work, late at night, perhaps studying for his exam the next day. It is dark and the only light is artificial: a candle. However, using a candle is risky, especially when you are trying to read a tiny note that is written in the between the lines: drip. 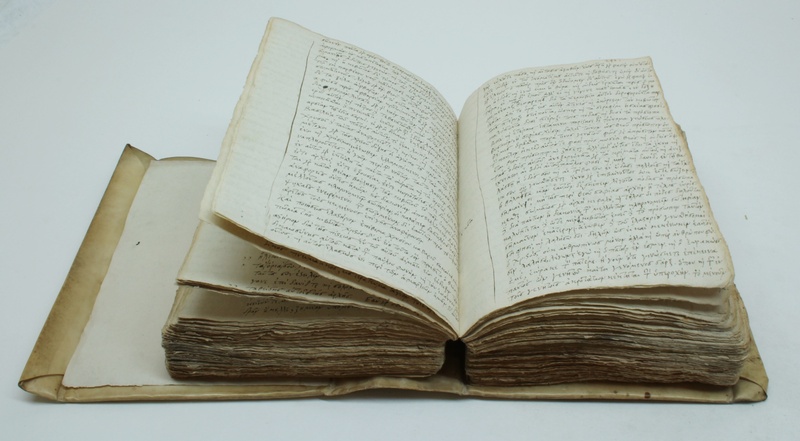 Dirt and other undesired elements on the page are very frequently encountered and the examples here show how they can be evidence of how the reader interacted with the manuscript. From time to time, however, rather than showing negligence or carelessness, human interaction with medieval books shows something else, for example how liberal or prudish a reader was. Check out what the user of the fencing manual in Fig. 7 did to cover up the private parts of the two opponents: big fat drops of red wax (of the type used for making seals) were splashed on the page to bring the scenes in line with the standards of the prudish reader. No problem to behold two stabbing figures in a battle for survival, but we don’t want to see them do it naked. What a dirty book. Postscriptum: Kate Rudy (St Andrews) has done substantial work on dirt in medieval books and has even found a way to quantify dirt with the help of a densitometer (read about it here). When you use something for a thousand years, it is bound to get dirty. Medieval books often show stains and marks on their pages, usually from readers who did not always take very good care of the objects. Medieval books also collected a lot of loose dirt, which sometimes falls out when you thumb through their pages as a modern-day book historian – naturally with clean hands, though preferably without white gloves (here is why). While this dirt is often simply junk, the bits and pieces – twigs, pieces of leaves, dried flowers, pins – may also have had a function. 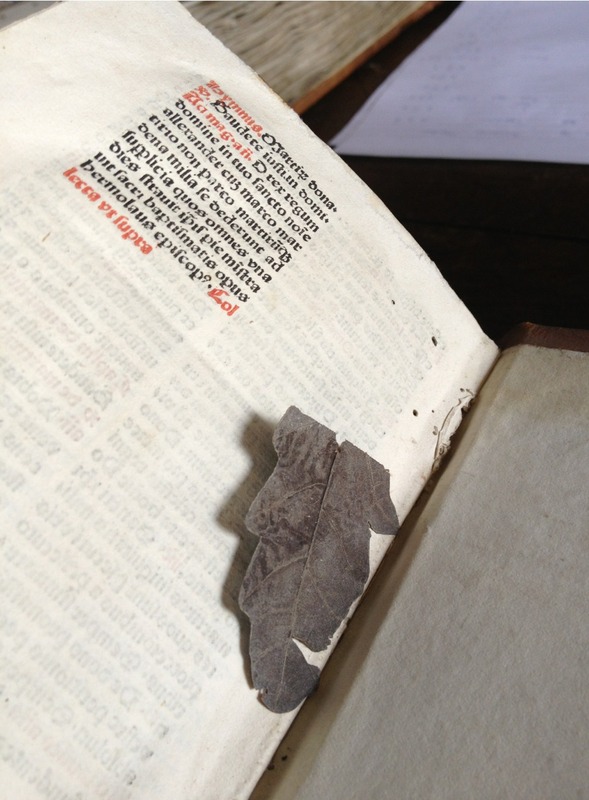 A dried leaf from a tree may for example have been stuck between the pages to serve as a bookmark. In that sense junk can be seen as as a cultural artefact that adds to our understanding of medieval books and their users. Here are some examples of useful dirt. 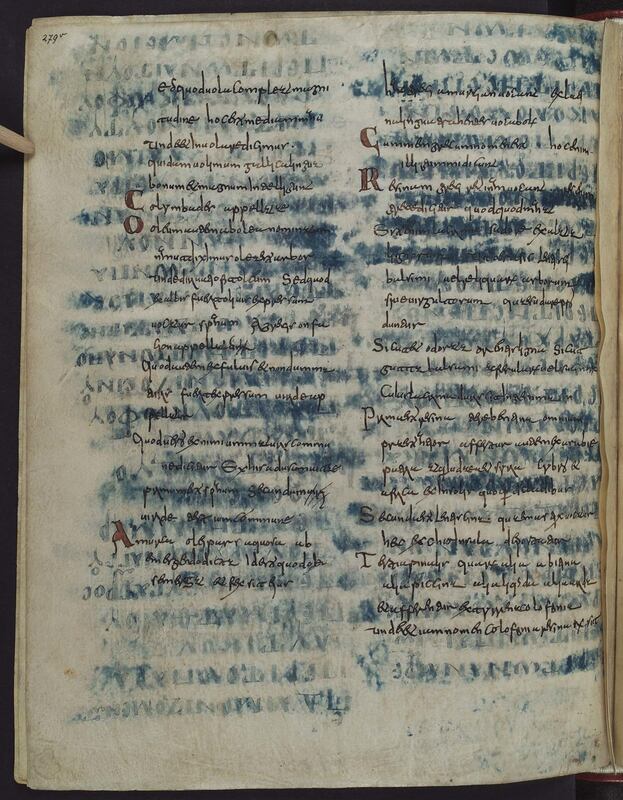 Considering that every medieval books was handwritten and that their makers will have had inky fingers, you’d expect a lot of ink stains on the page. Surprisingly, medieval pages are almost always free from such stains, perhaps because scribes were careful where they put their dirty hands. Every now and then, however, you encounter an ink stain (Fig. 1). The one seen in Fig. 1 is special because it accompanies an inky fingerprint. This encounter is thrilling. When you place your own finger on top of it, you are suddenly closely connected to a person that lived hundreds of years ago. More importantly, the stain in Fig. 1 adds to our understanding of the book in which it features. Crucial in this respect is the observation that the stain is produced by printers’ ink, which is much blacker and “silvery” than what medieval scribes used. The individual who was attached to the finger was therefore likely a printer. This set of observations prompts an intriguing question: why did a printer in the midst of printing a text feel the need to consult this manuscript? While speculative, the answer may well be that he was actually printing the text on these medieval pages (a work by Bonaventure), meaning that he may have used the handwritten copy to set his type from. This useful information flows directly from dirt that was inadvertently left behind on the page. If you are a regular reader of this blog you will have been introduced to elaborate medieval bookmarks, such as carefully designed parchment disks, glued-on tabs marking the start of a new text or section, or strings of parchment that could be “draped” between pages to identify key passages (see this post). 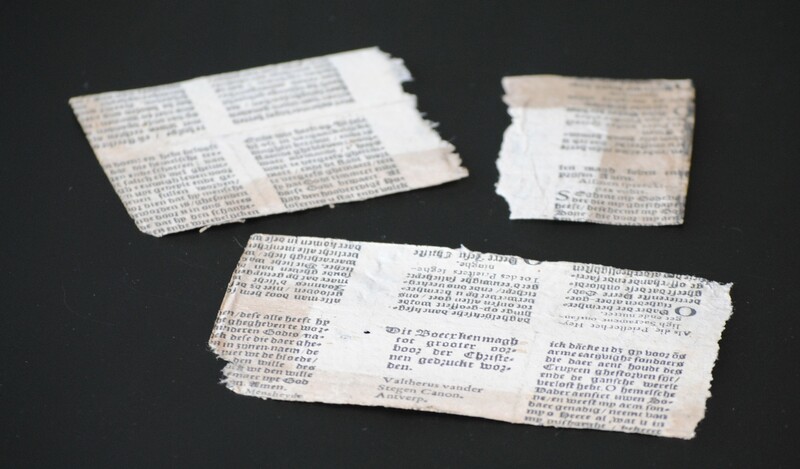 However, medieval readers also produced makeshift bookmarks, made from essentially anything that they found lying on their desk or on the ground, as we still do today. 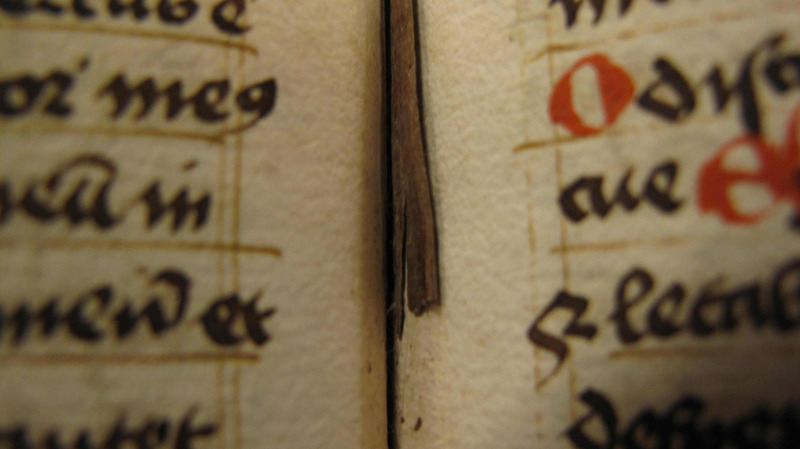 So, we sometimes encounter twigs or pieces of straw, which no doubt ended up in the book to mark a certain page (Fig. 2). Perhaps an even more natural choice for a bookmark would be a leaf from a tree. I found a particularly nice one tucked away in the back of a volume placed in the chained library in Zutphen, the Netherlands (Fig. 3). The leaf has become hard and may well be as old as the sixteenth century, the date of the book in which it is found. In fact, it feels and looks like a piece of plastic in the shape of a leaf. It may have been put in the back of the book so as to make it easier to find a ready bookmark when it was needed. Not so commonly found in medieval books, yet often seen in their seventeenth and eighteenth century counterparts is sand; sometimes lots of it. 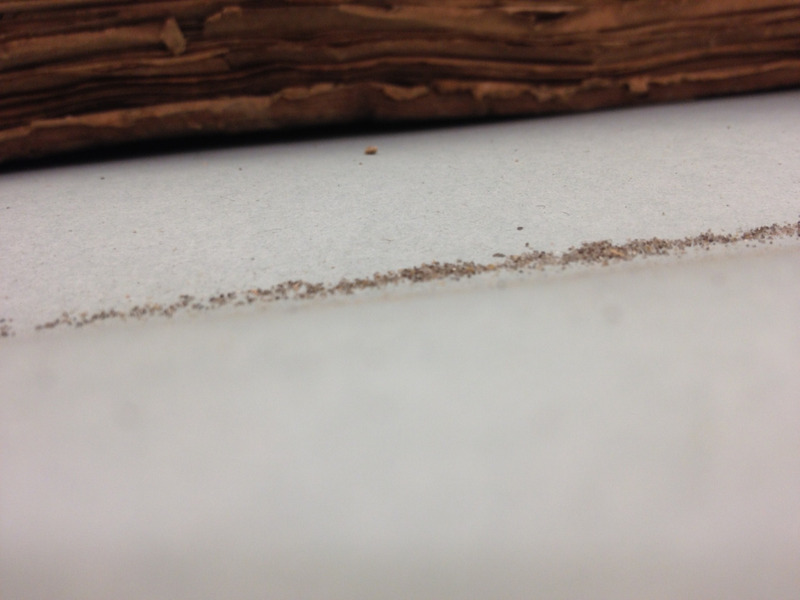 In fact, when I looked at an account book from 1717 in the Leiden archives not so long ago, a little mountain of sand had piled up when I wanted to close the book (Fig. 4). This is because the sand was used to dry the ink. Text would be added to such account books even after the pages had been folded and bound into an actual book. When a new entry was made (on a blank page), sand was sprinkled on top to as to prevent an offset on the facing page. As with the fingerprint, it is thrilling to touch this sand, knowing that the last person running it through his fingers was an eighteenth-century scribe. The same account book in Leiden contains many receipts: actual proof of payment made by the municipal government to people working in the town hall (their wages), schools (for the purchase of books) and guards. These receipts (small strips, just a bit bigger than what you get in stores today) were kept in bundles for convenience. There is no easier way to do this than pushing a pin through them (Fig. 5). Pins were also use in both early-modern and medieval books to mark a page. They would not necessarily have to stick out from between the pages: the “bulkiness” of the pin would sometimes be sufficient to guide the reader to a specific page (Fig. 6). The prettiest “dirt” I encountered – and the only time I found it – is seen in Figs. 6-7. The page in question contains a decorated initial (out of view). After the scribe had copied the page, the decorator would add these with a brush and paint. As he was moving his hand towards to location where he needed to add decoration, in a particularly attractive shade of blue, a drop fell from the brush he was holding. It produced a perfect circle in the lower margin. Interestingly, while such blobs can be removed quite easily when they have dried (with a gentle flick of a knife), this one remained. 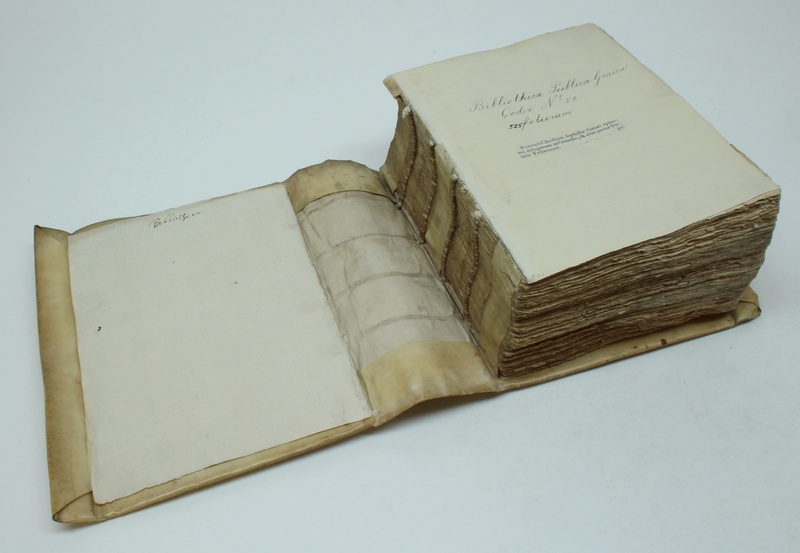 Not only during the production process of the book, but also throughout the object’s centuries of use. 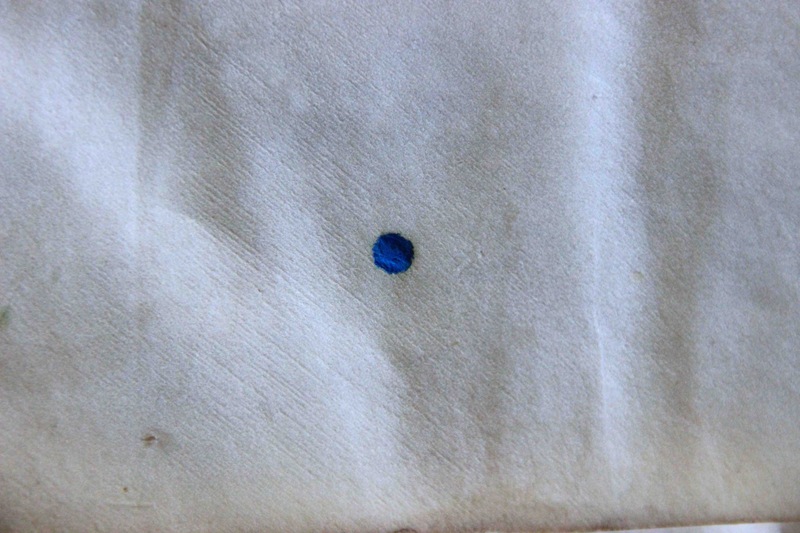 I like to think that the previous users of the book shared my feeling that this blue blob is just the prettiest thing ever. Every so often one encounters dirt that is perhaps not particularly insightful as to how a medieval book was used or produced, but it does provide surprising information about the owner, namely that he had a cat (Fig. 8). While this final example brings a “tongue in cheek” conclusion to an otherwise serious post, it does show that books apparently lay open on a desk unattended by the owner. Curiously, it is not the only example of a cat having free access to an open manuscript. 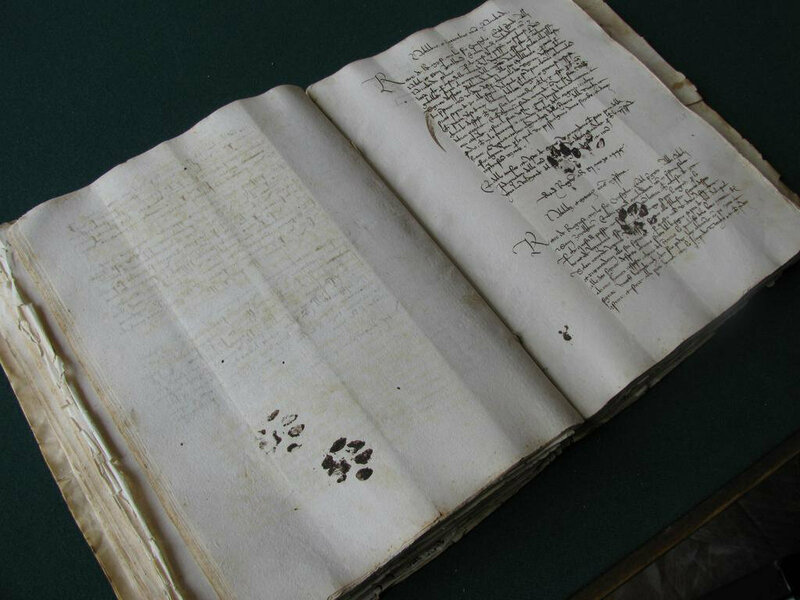 Less well known than this inky-cat-paws manuscript (which went viral after my tweet back in 2013; more here) is another book “touched” by a cat, currently kept in Balliol College Oxford (Fig. 9). Here, too, we find evidence of a cat walking over an open book, although this time the paws were dirty, not inky. While we are perhaps inclined to regard dirt as an unwanted addition to the medieval book – which is an object that should be spotless, after all – the bits and pieces shown here act as historical clues that shed light on how a book was produced or used. There is an interesting parallel to be drawn with the concept of “damage”. 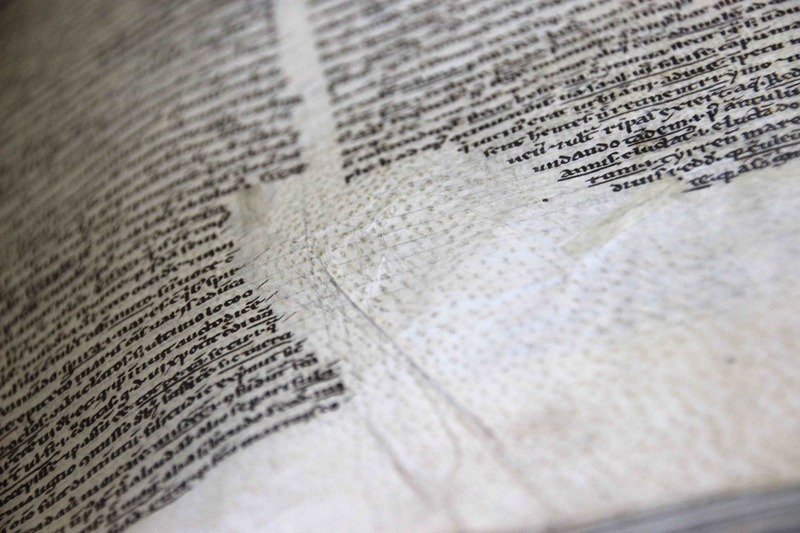 This, too, is often seen as a flaw when encountered in a precious medieval book, while, in fact, it may offer crucial information about how the object was used (see this post). Dirt is an intrinsic part of the historical artefact that is the medieval book and deserves to be studied as such. Old furniture, broken cups, worn-out shoes and stinky mattresses: we don’t think twice about throwing things out that we don’t need anymore. And books? Here things are a bit different. Apart from the fact that you may find it morally abject to throw out a book, that noble carrier of ideas, the object retains its economic value much longer than many other man-made things. Old and worn books will usually have a second – third, fourth or fifth – life in them, for example on the shelves of the secondhand bookstore. Indeed, old age may even increase their value dramatically, as visitors of book auctions will know. The final curtain call of any book, including medieval ones, is when its content is no longer deemed correct, valid, or useful. 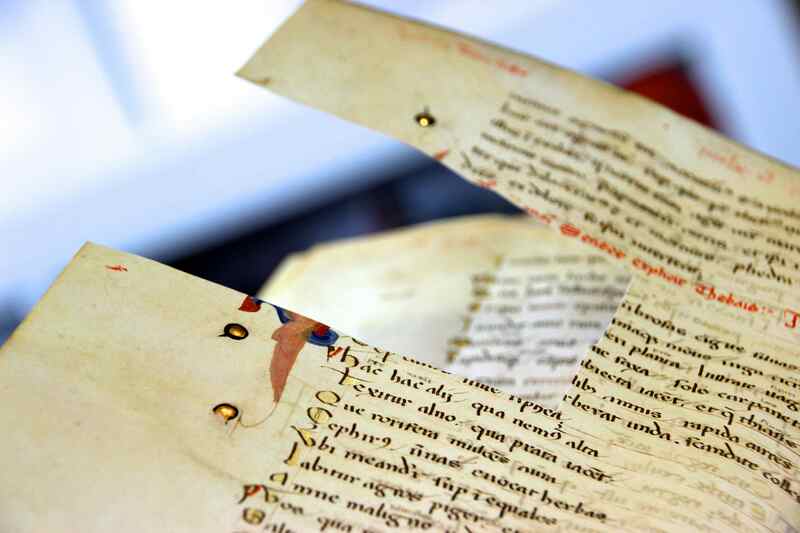 Between the end of the Middle Ages and the nineteenth century thousands and thousands of medieval manuscripts were torn apart, ripped to pieces, boiled, burned, and stripped for parts. While these atrocities were undertaken to various ends, the ultimate explanation for this literary genocide is the same: the old-fashioned parchment book had run its course. It was forced to bow and leave the stage, where the printed book was now stealing the show. This post sheds light on a dark chapter of wilful destruction – which came with surprising benefits for the culprits. If you have followed my blogs – both here and on Tumblr – you known I have a soft spot for so-called manuscript “fragments”. Ranging from small snippets no larger than your pinky to full leaves, they were the product of the knives of bookbinders. When Gutenberg invented moving type, handwritten books became old-fashioned overnight. All over Europe they subsequently became the victims of recycling at the hands of binders, who cut them into pieces and pasted them inside bookbindings, where they often still remain. And so we encounter a little strip from a medieval Dutch Bible glued to the inside of a sixteenth-century binding (Fig. 1); and snippets from a medieval Hebrew text peeping out of a damaged binding (pic at the top). 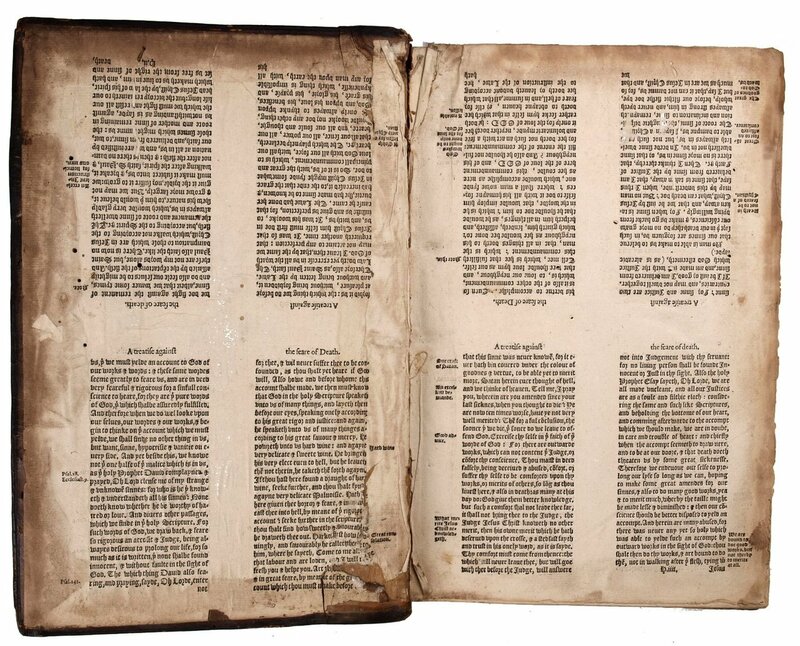 These examples show how medieval books were mutilated and stripped for parts, like cars at a scrap yard. Thousands of them disappeared this way – though fortunately not without a trace. 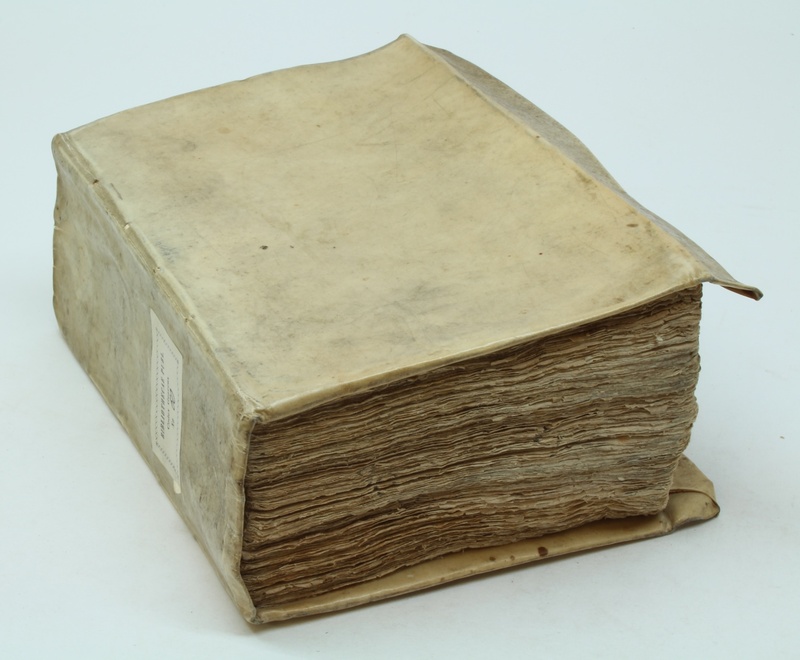 The strength and durability of parchment made medieval pages ideal for supporting bookbindings. Tailors loved to recycle the material for the same reason. The pages in Fig. 2 form the lining of a bishop’s mitre, to which a layer of cloth was subsequently pasted. The practice is observed in other mitres as well (two examples are mentioned in the comments at the bottom of this blog). What’s really remarkable about the lining seen above is not so much that the poor bishop had a bunch of hidden medieval pages on his head, but that they were cut from a Norwegian translation of Old French love poetry (so-called lais). Lovers were chasing each other through dark corridors, maidens were frolicking in the fields, knights were butchering each other over nothing. All the while the oblivious bishop was performing the rites of the Holy Mass. There are other examples where tailors (I’m putting mitre makers under this label for convenience) used leaves from medieval manuscripts to “stiffen” the cloth. Dr. Lähnemann, chair of German Studies at Newcastle University, has identified several such cloth items with hidden content in her work. An unusual case is seen in Fig. 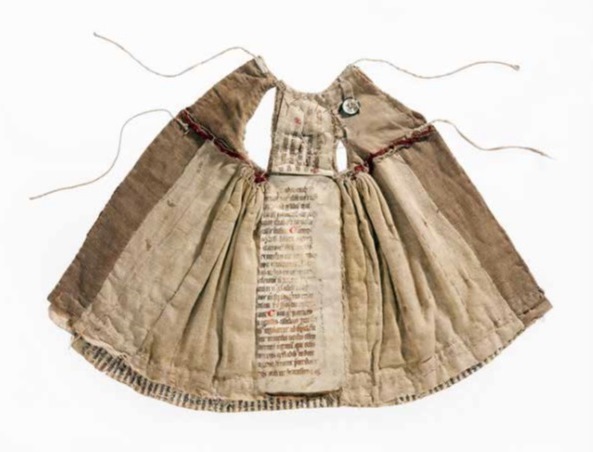 3: a dress made in the late fifteenth century by Cistercian nuns in Wienhausen, Germany. It was not meant to be worn by people, however, but to be draped around a statue in the convent. It’s not unlike doll’s clothes you pick up in the toy store today, except that the remains of a Latin text are hidden inside. And then there were the scribes. Surrounded by used books and with a pen knife in their hand, makers of medieval books were bound to do some damage. There are several ways in which old pages could be put to good use in the monastic scriptorium or library. You can make bookmarks out of them, as I have shown in a recent post (here). A more hidden way of recycling concerns the so-called palimpsest, where the words were scraped off a page after which a new text was copied down on it. In the early Middle Ages entire books were palimpsested. There was a definite upside to this practice from the scribe’s point of view. It gave him, without effort, a pile of parchment to fill with something new: it allowed him to cut corners without having to cut corners, so to speak (Fig. 4). There was a downside as well. As seen in Fig. 4, the scraped away lower text never fully disappeared from sight: it tended to pop up unexpectedly throughout the new book. While the text at the forefront (the upper text) of this spectacular manuscript dates from the eight century, what’s hidden underneath it is much older. To produce this manuscript a fifth-century copy of Paul to the Romans was palimpsested, as well as parts of a sixth-century Gospel Book in Greek uncial letters (the blue text that is shining through). 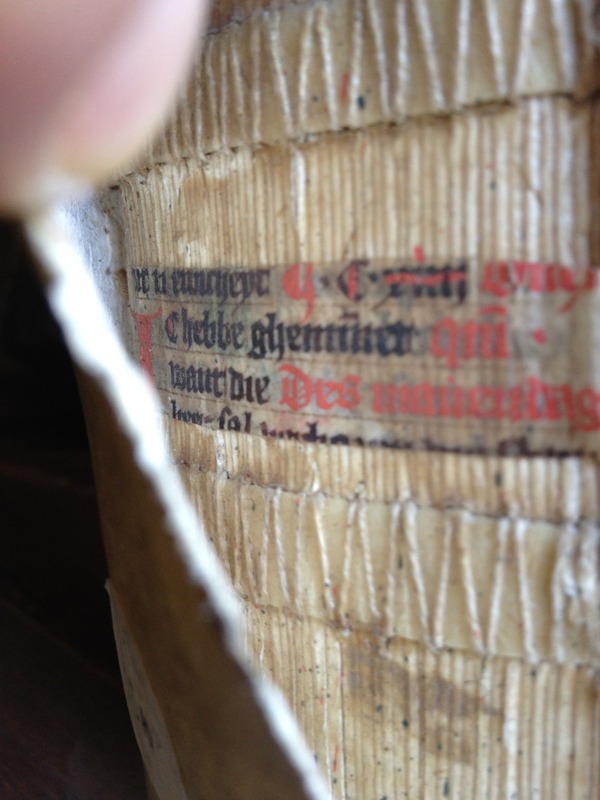 While it is a thrill to look for bits and pieces of medieval text inside a bookbinding or below the surface of a page, destroying books – especially medieval ones – is bad. 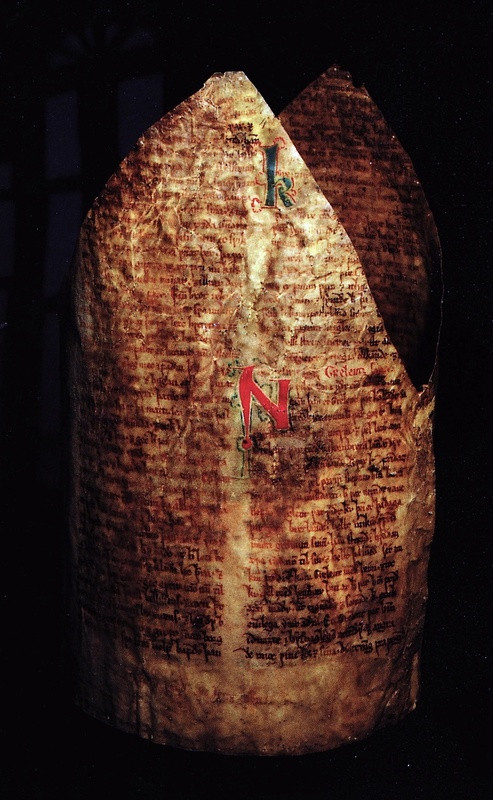 However, the cases of recycling shown here also point out how very useful the second life of the manuscript could be. To medieval scribes and post-medieval binders and tailors it must have been a joy to have piles of recyclable parchment books at their disposal. Moreover, to speak as an optimist, their slicing and dicing is proving most useful. Thanks to the destructive practices in the past we at least have some pages or strips left from given manuscripts – which would otherwise have completely disappeared. Seeing a few lines is often enough to identify a text and determine when and where it was copied. In this way fragments become blips on the radar: they add, often significantly, to the study of medieval literary and scholarly culture. While destroying medieval books is bad, it is most useful to have their sorry remains. 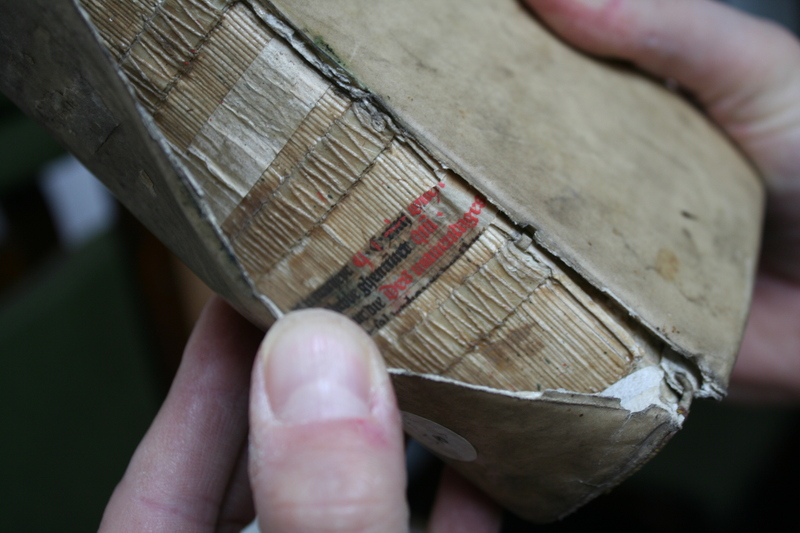 Note – More about fragments in bookbindings in this and this post. 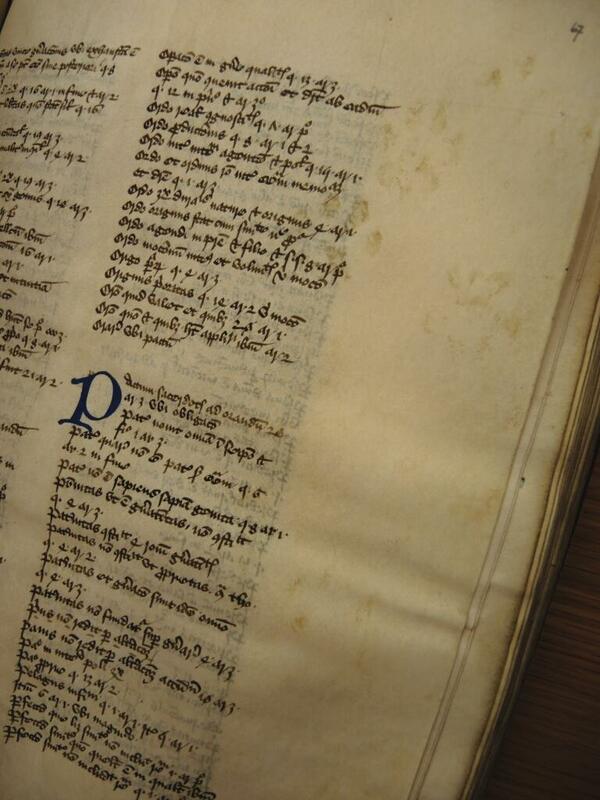 Take a closer look at a palimpsest here. More on using manuscripts in textiles here. My favourite activity is to touch, smell, and listen to the crackling sound of cows and sheep that have been dead for a thousand years. That’s right, I am talking about medieval parchment, the standard material for books made between the fifth and thirteenth centuries. Animal skin replaced papyrus (standard up to the fifth century) and would ultimately be challenged by paper, which competed for dominance during the later medieval period. Parchment was resilient, however, and it was even used by early printers, including Gutenberg himself – showing the use of animal skin did not die with the medieval manuscript. There is a lot you can tell from medieval skin. Like a physician today, the book historian can make a diagnosis by observing it carefully. The best quality, for example, feels just like velvet. It usually has an even, off-white colour, and it makes no sound when you turn the page. Bad skin, by contrast, crackles. It is of uneven thickness, and shows staining and a variety of colours. Unlike what you may have thought, looking at imperfect skin is far more interesting than studying its perfect counterpart. This is because a defect tells a powerful story, shedding light on the book’s production and providing clues about its use and storage post-production. Here’s the skinny on bad medieval parchment. 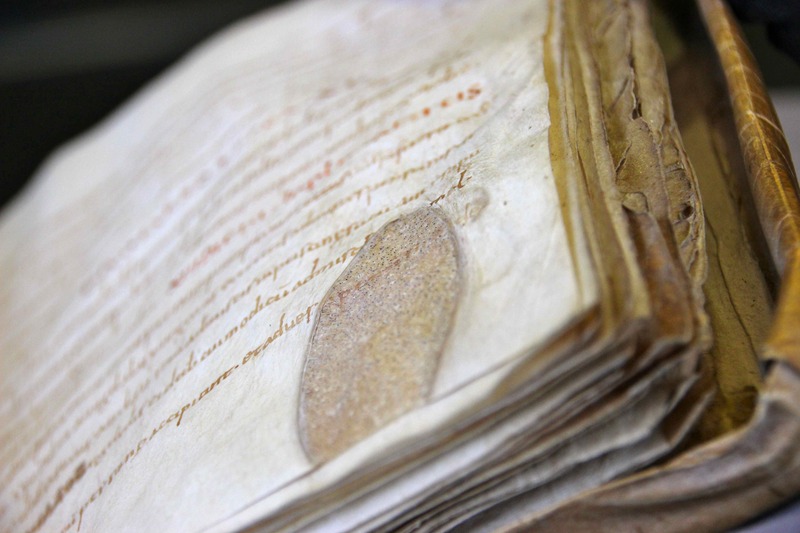 Scribes were usually not the ones to blame for a manuscript’s bad skin. A fair part of that honor goes to the parchment maker. Preparing parchment was a delicate business. In order to clear the skin of flesh and hair, it was attached to a wooden frame, tight like a drum. If the round knife of the parchment maker (the lunellum) cut too deep during this scraping process, elongated rips or holes would appear. As a result the reader is given an unexpected sneak peek onto the next page – where a dragon may just be introduced into the story (Fig. 1). We encounter such holes frequently in medieval books, which suggests that readers were not too bothered by them. Many scribes will have shared this sentiment, because they usually simply wrote around a hole. Some placed a little line around them, as if to prevent the reader from falling in. 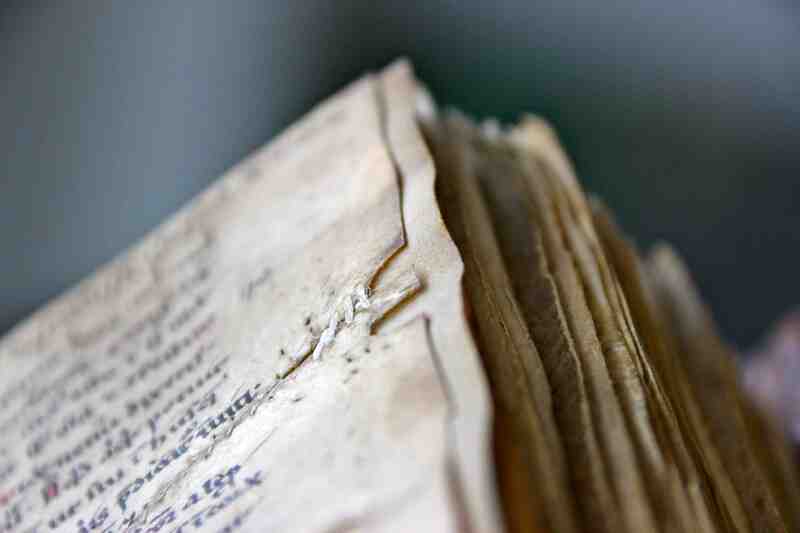 The jabs of parchment makers – and the resulting holes – were sometimes stitched together. Fig. 2 shows a former rip (a long one) snaking across the page: the scribe has stitched it up like a patient in post-op. Repairing holes was sometimes done more eloquently, as seen in Fig. 3, as well as in the image at the top of this post (Engelberg, Stiftsbibliothek, MS 16). In both cases the holes are not made to disappear, as with the stitching in Fig. 2, but they are highlighted by coloured threads. 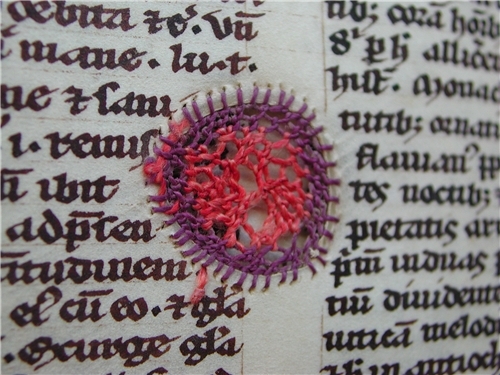 In some monastic communities this must have been common practice, given that they repaired a lot of books with such “embroidery” (some examples in this Tumblr post). The practice turned defect into art: good-looking bad skin. Another skin problem encountered by scribes during a book’s production was the animal’s hair follicle – the skin organ that produces hair. These follicles show as pronounced black dots on the white page. Often parchment makers or scribes were able to sand them away, producing the desired smooth and cream-colored surface. However, if the follicles had been too deep in a calf or sheep, no dermatologist could have removed the imperfection, let alone the blunt instruments of the scribe. The only thing to do was to write around the patch (Fig. 4). The follicles are helpful because they allow us to determine – from the distance between them – whether the animal was a calf, a sheep or a goat. This, in turn, may shed light on where the manuscript was produced: the use of goat, for example, often points to Italy. Bad skin may also tell us something about the individuals who owned, read and stored manuscripts. The presence of holes and rips may for example indicate the cost of the materials. 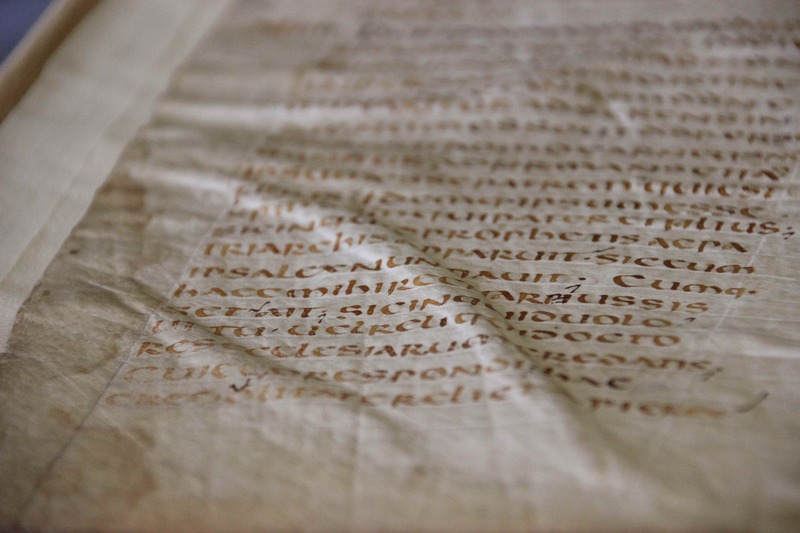 Studies suggest that parchment was sold in four different grades, which implies that sheets with and without visible deficiencies may have been sold at different rates. If this was indeed the case, an abundance of elongates holes in a manuscript may just point at an attempt to economise on the cost of the writing support. In other words, bad skin may have come at a good price. Parchment provides other information about readers as well, for example that he or she stored a book in an unsuitable location. Damp places, for one, would leave a mark on the manuscript’s skin, as is clearly seen in a manuscript I sometimes call the “Mouldy Psalter” – for mouldy it is (Fig. 5). On nearly every page the top corner shows a purple rash from the mould that once attacked the skin. It is currently safe and the mould is gone, but the purple stains show just how dangerously close the book came to destruction – some corners have actually been eaten away. 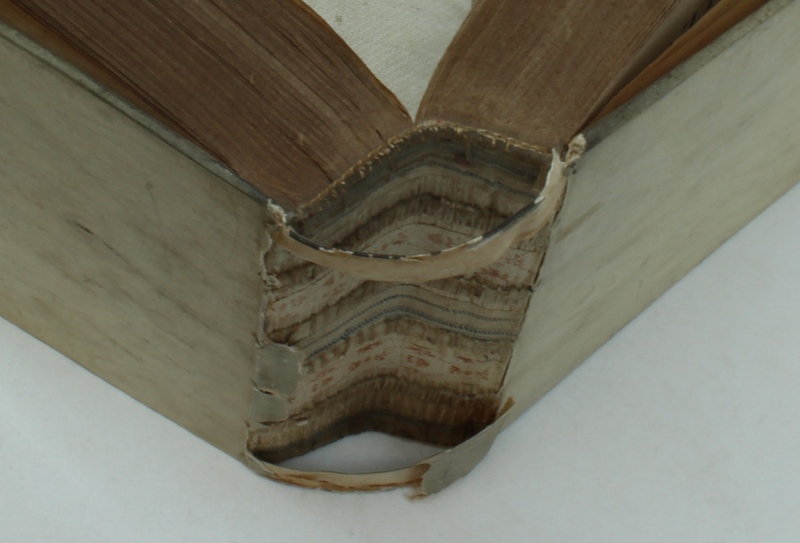 Similarly, if a book was stored without the proper pressure produced by a closed binding, for example because the clasp was missing (as explained here), the parchment would buckle and produce endearing “waves” on the page (Fig. 6). Apart from such attacks by mother nature, a manuscript could also be scarred for life by the hand of men – those evil users of books. Well known are cases where scribes and readers erased text with a knife, either because the reading was wrong or because they disagreed with it. However, in the wrong hands a knife could easily have a more severe impact on the book’s skin. All those shiny letters on the medieval page were too much for some beholders. The individual that gazed at the golden letters in the manuscript shown in Fig. 7 used his knife to remove some of them. Appropriately, it concerns a copy of Seneca’s Tragedies. While the velvety softness of perfect skin can be quite appealing to handle, getting to know imperfect parchment is ultimately more interesting and rewarding. Damage is telling, as this post shows, and it may shed light on such things as the attitude of scribes (who did not necessarily mind holes on the page), the manner in which a book was stored by its owner (with a missing clasp or in a wet environment), and even the state of mind of those looking at it (“Must cut out golden letters!”). As a book historian it feels good to work with bad skin. 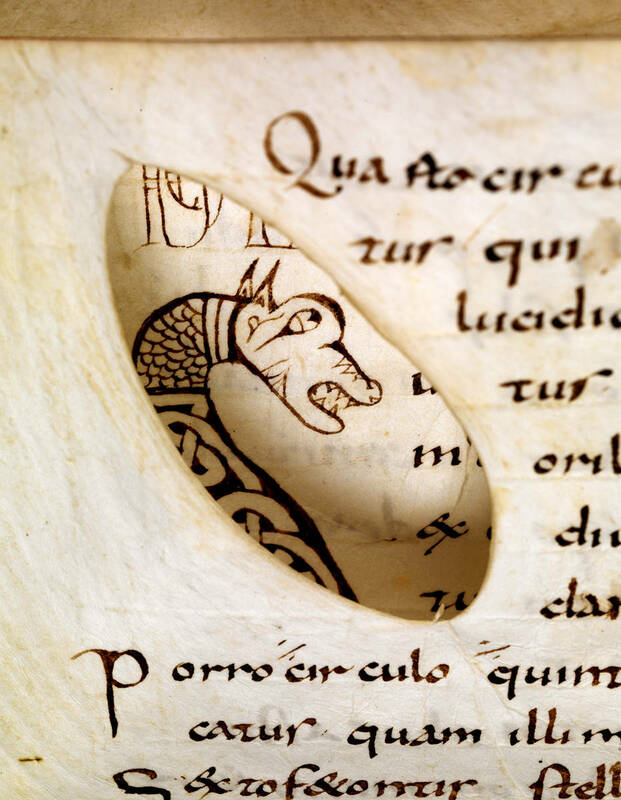 Note – A few days after publishing this post I found a great image in which a scribe used three holes in the page to produce the face of a laughing man – turning the flaws into art. More here. Also, since posting this I made a brief YouTube film with the Khan Academy, which shows what good and bad parchment looks like – and sounds (!). Here is the link. While our eyes are naturally drawn to pages filled with color and gold, those without decoration can be equally appealing. Indeed, even damaged goods – mutilated bindings, torn pages, parchment with cuts and holes – can be highly attractive, as I hope to show in this post. The visual power of damage may be generated by close-up photography, with camera and book at just the right angle, catching just the right amount of light. The following images celebrate the beauty of the injured book, the art of devastation. Leiden, Universiteitsbibliotheek, BPL MS 191 A (12th century). Pic: the author. This is what I call a Frankenstein page. It is composite in that the top part is from a different sheet, perhaps even from a different animal, than the lower half. The sheet used by the scribe was short on one side, but he still wanted to use it. In came the patch that is now the top half of the page. Where the two pieces of skin meet the scribe-surgeon punched holes through which he pulled a thin cord, joining them together. The operation was successful, the insert was not rejected, and so the page could be filled with text. Miraculously, the low-quality book was never thrown out. Instead, it limped, for centuries, to the finish line of our present day – to the safety of the Leiden University Library. Leiden, Universiteitsbibliotheek, BPL MS 138 (15th century). Pic: the author. 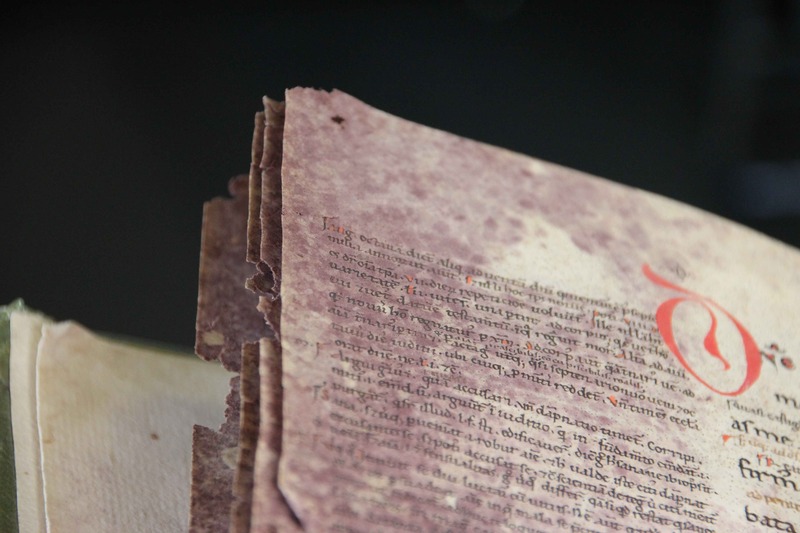 This poor-looking manuscript from the fifteenth century looks worn and beaten. It is so happy to be retired that you can almost hear a groan of disappointment when you take it out of its box. The manuscript is filled with school texts and it was heavily used over a long period of time. At some point the binding gave in and began to arch, like an old man with a painful back. It could do so because the book was fitted with a cheap, so-called “limp binding”. This type lacked the wooden boards of regular bindings – as well as the firm support these boards provided. Such bad backs are reflective of how popular the books once were. Leiden, Universiteitsbibliotheek, BUR MS 1 (c. 1100). Pic: the author. This page needs a shave. From time to time you encounter a hole in the page, but this one is special. 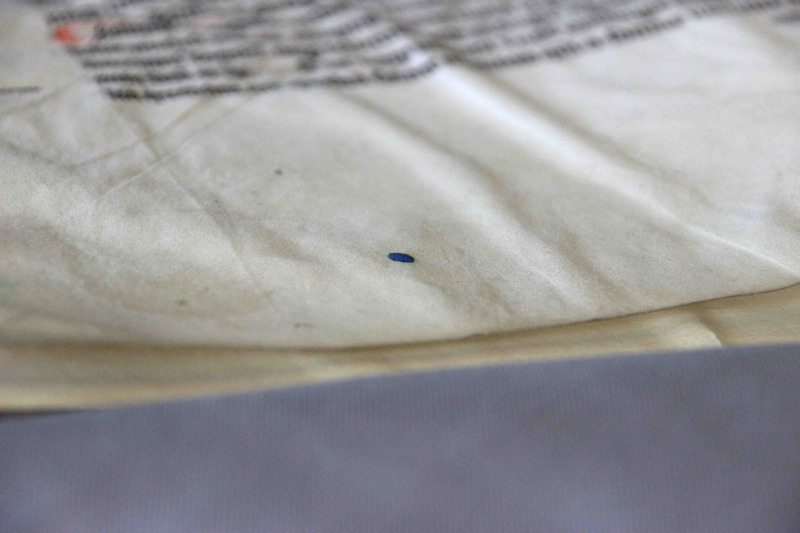 An important stage in the preparation of parchment was removing the hair from the skin. 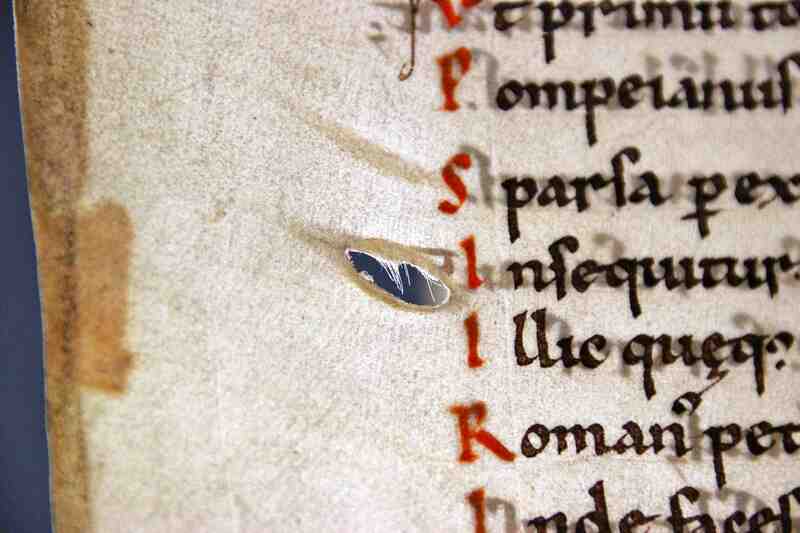 When the parchment-maker pushed too hard with his knife, a cut like this would appear. Not unlike a distracted hairdresser, the individual who prepared the parchment overlooked a few tiny – white – hairs, which still inhabit the hole. It makes for a pretty picture with the light from behind, which also highlights the text on the other side of the page. Leiden, Universiteitsbibliotheek, VLO MS 92 (c. 1000). Pic: the author. This parchment sheet came from an animal with skin problems. It appears that the cow had been in a fight and was kicked. As your butcher will tell you, such kicks result in scar tissue, which he will remove. Judging from how infrequent we encounter such patches in medieval books, we may assume that skin with such damage was not processed into parchment. 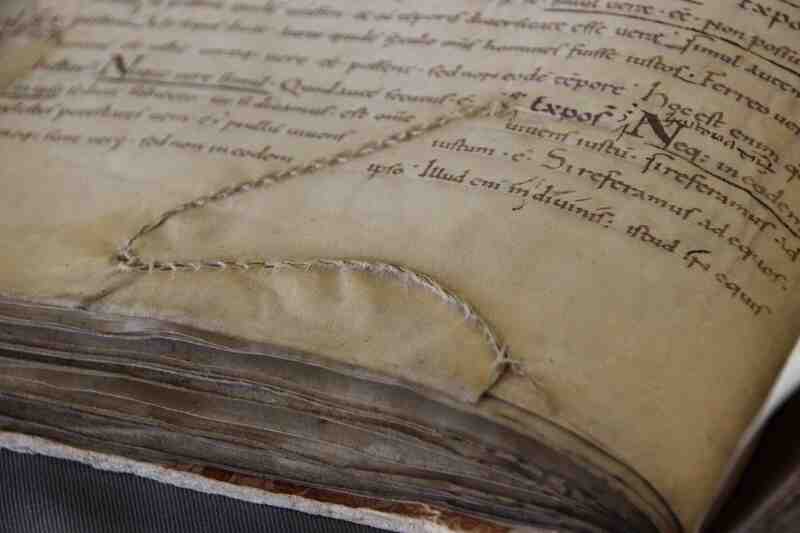 However, this particular book was made from off-cuts: strips of bad parchment that were cut away and thrown out. Remarkably, someone fished them out of the bin and produced a book from it (more details can be found in this YouTube movie I made). Thus this “garbage manuscript” exposes an urge for cheap materials as well as a dispute between two medieval cows. Leiden, Universiteitsbibliotheek, BPL MS 2896 (11th century). Pic: the author. And so it happened that a certain medieval reader did not pay attention and placed his book in a moist environment. And so it happened that he forgot all about the book. 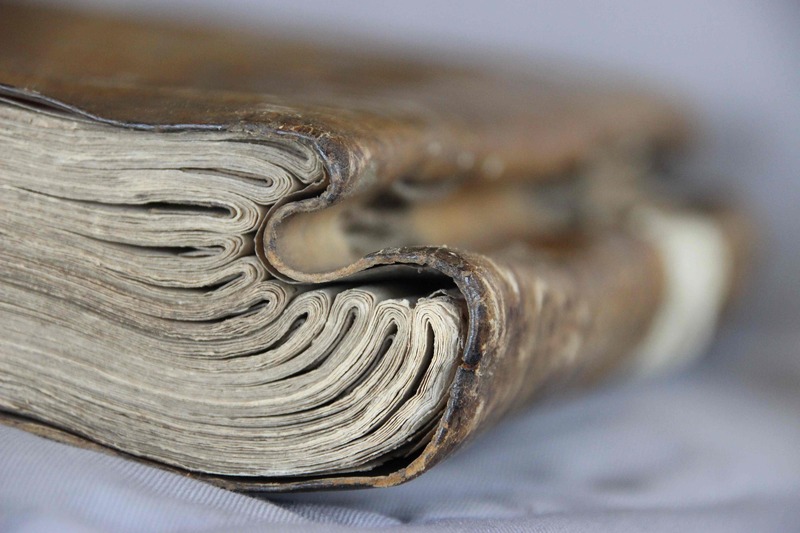 That is the story behind the mould on the pages of this eleventh-century Psalter. The fungi turned purple over time, producing a neat contrast between the high quality white parchment sheets and their damaged corners. It’s the beautiful despair of a book under duress. All images were taken with a Canon Eos 600D camera and a Sigma DC 18-250 mm lens (at aperture value 6.3). This blog entry focuses on a book fragment I encountered in Leiden University Library earlier this week while studying twelfth-century material with my research team. 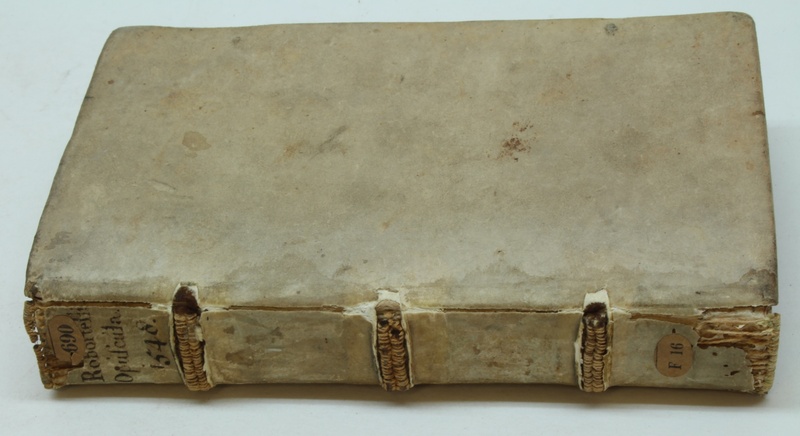 As discussed in an earlier blog, after the invention of printing many handwritten books from the medieval period were cut up to be recycled for use in bookbindings, for example to support the bookblock as seen here. Cutting up printed books was a far more infrequent practice, it seems; rare even. This is in part, of course, because such books were made of paper, a much more fragile material than the parchment sheets from medieval books, and therefore less suitable for holding together a bookbinding. 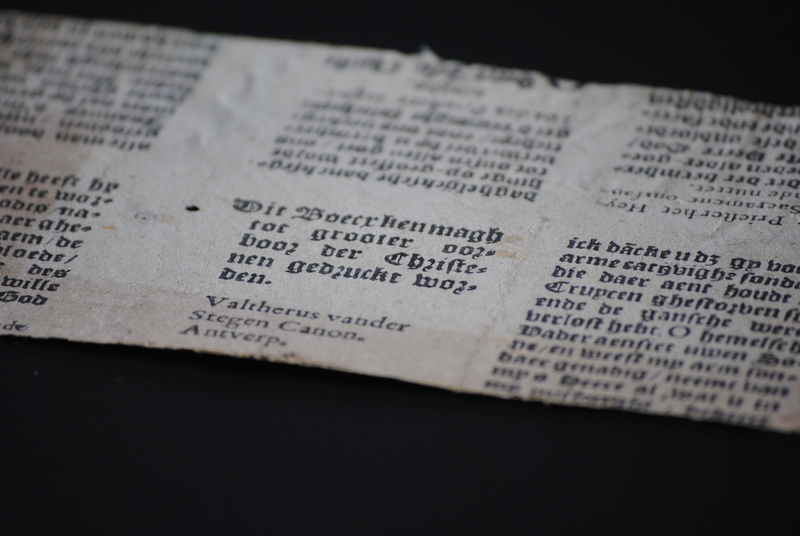 This is the story of such a rare printed fragment. And what a story it is! A mere glance at the fragments reveals a most remarkable feature: they were never part of an actual book. If you look carefully, you notice how part of the text can be read as it is shown in the image, while another part can only be read if you turn the page 180 degrees. In other words, the fragments are parts of sheets that were uncut and unfolded. Come again? A printed sheet of paper coming off the press usually consisted of two, four or even eight pages on the one side, and as many on the other. When both sides were printed the sheet was folded into a quire, the building block of the book. That never happened in this case, likely because the sheet was rejected by the printer and thrown in the proverbial bin – after which it was likely sold to a bookbinder and recycled as waste paper. Uncut printed sheets were rare at the time, but even rarer today. Fortune has it that I recently encountered another specimen, kept in the Folger Shakespeare Library in Washington (check out this blog I wrote about it). The Leiden fragments are also special for another reason – one that sheds light on early-modern book culture in a different way. Note how the smallest snippet contains a brief section printed in a slightly larger typeface (see image below). It reads: “This book may be printed for the greater good of Christians” (“Dit Boecxken magh tot grooter oorboor der Christenen gedruckt worden.”) This intriguing colophon-like message has nothing to do with the contents as such, but reflects the book as an object. In what was likely the last page of the book, it tells the potential buyer that it was safe to purchase this book. Underneath it we read, in a different typeface: “Valtherus vander Stegen Canon. Antverp.” [Walterus vander Stegen, Canon in Antwerp]. What gives? Leiden, Universiteitsbibliotheek, BPL 3254, fragment 1 of 3, detail (Photo: Erik Kwakkel). 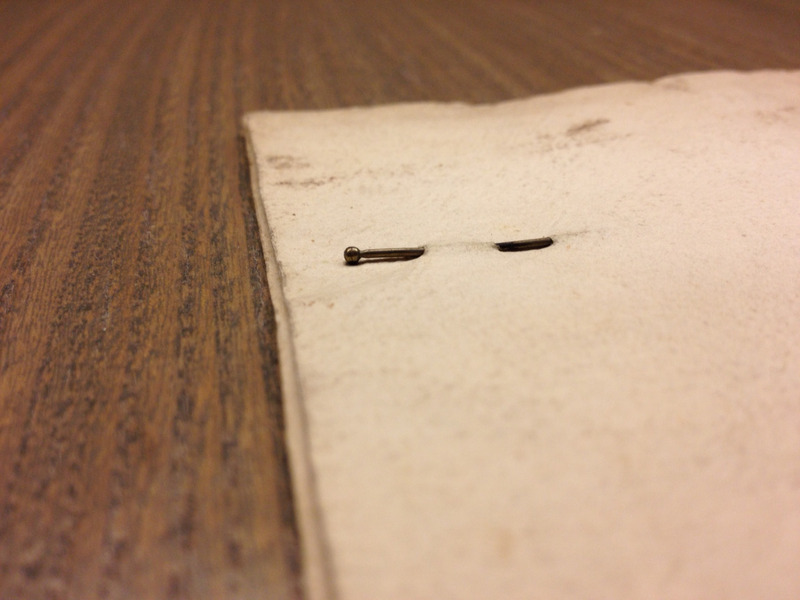 Thus the tiny fragment and its two siblings bear unexpected evidence of some of the problems encountered by early printers: censorship and the affiliated fuss of seeking and printing Church approval; as well as the complexities of a new medium that involved printing several pages at the same time and on different sides of the paper – producing rejects, from time to time. What I find most astonishing, however, is that one of the three surviving snippets of the lost book should contain the approbation that gave life to the object it was once part of. The Inquisitor would have approved. I wish to thank Paul Hoftijzer (Leiden) for his input regarding printed approbations.